This photo shows E1 plinthed at Deloraine on 27 April 2003. 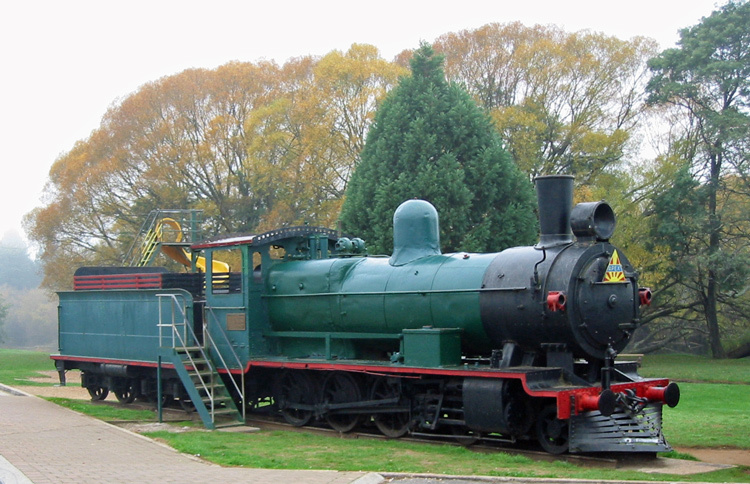 "This locomotive was built for the Tasmanian Government Railway by Beyer Peacock & Co., England in 1907 at a cost of (Pounds) 5,370. It was last used in 1962 and then stored until presented to the Deloraine Municipality during the Railway Centenary in February 1971 and was sited by the Deloraine Apex Club on the 24 July 1971. The rail line from Launceston to Deloraine was the first constructed in Tasmania and was opened on the 10th February 1871. Total working weight - 72 Ton. Tractive power at 85% capacity - 19.947 Lbs." a Information provided by Melanie Dennis via email dated 14 July 2004.
c L. Oberg, 'Locomotives of Australia', published by J. W. Books Pty Ltd, Brookvale NSW. 1982 reprint.